The benefits of SAP process automation for both the business and IT are significant and easy to understand. By automating tedious and time-consuming day-to-day operations and error-prone manual data entry, you free up important IT resources and empower business teams to spend more time on strategic tasks, and less on tedious repetitive tasks. You’ll improve data quality and accuracy, and your employees will be happier, more productive, and experience less burnout. While the benefits are clear, they’re often not enough to justify the investment in process automation technology. Leadership might require business teams to put a business case together for improving employee satisfaction and data quality, using measurable ROI. Winshuttle’s usability database, featuring input from over 2,000 customers (companies of all sizes, from a wide variety of industries) shows that users are uploading over a billion records per year! This serves as accurate benchmark data based on real-world savings to calculate the potential time and cost savings for organizations. 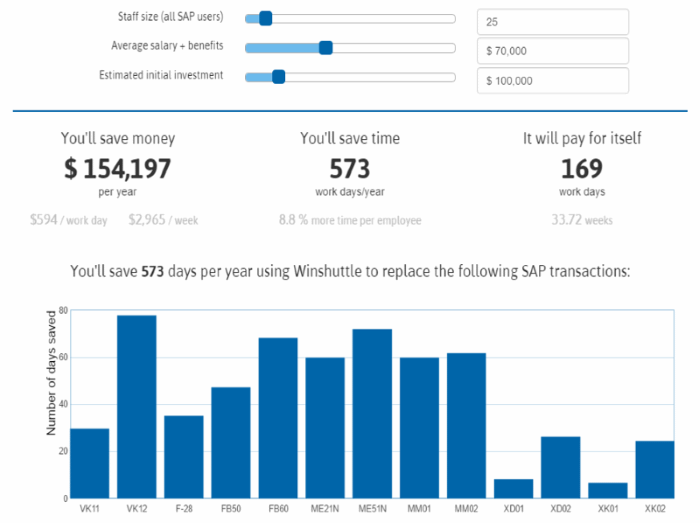 The easiest and quickest way to use Winshuttle’s benchmark database and explore potential savings is through our free ROI calculator tool. It’s designed to provide estimated savings and ROI a company can generate from an investment in Winshuttle technologies. All you need to enter is the volume of SAP data your organization processes every month, and you can estimate your potential ROI immediately (see the example below). The Business Value Assessment or BVA is an exclusive Winshuttle service that compares your user transaction data and your SAP logs with comprehensive benchmark data contained in our usability database. This is a more accurate, customized assessment of how we calculate the potential time and cost savings for your organization, giving you an excellent guide for prioritization and justification. 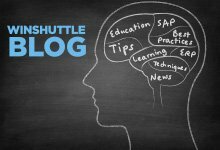 New customers use it as a way to identify areas or use cases, (or even users) to start using Winshuttle. Existing customers use it as a tool for continuous improvement. The BVA provides a comprehensive estimate for savings from SAP process automation through business efficiency, and also helps companies achieve direct savings in IT efficiency. I recently helped one of our customers on a business case where they had to create 20 LSMW scripts as part of a continuous improvement initiative in plant maintenance, materials, and finance. The systems integrator vendor they usually worked with quoted them $120,000 for the job. 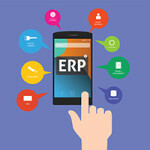 That is $6,000 per LSMW script, just for initial development – but the customer highlighted that due to constant changes in business requirements, they would probably need to make significant changes to the scripts throughout the year, and the cost of maintenance could easily end up doubling the initial cost. With Winshuttle, for a fraction of that cost, they could enable one key user in each line of business to create automation scripts, while a bunch of end users run the templates and do all the heavy loading without relying on an external provider with high hourly rates. 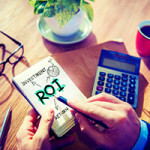 Companies that invest in technology for SAP process automation often create a business case and calculate potential ROI when they start the project but don’t necessarily close the loop until 6 or 12 months later. This is very important when measuring the results and checking whether the potential savings that were initially estimated has been achieved or not. Winshuttle provides a full set of reports and dashboards that look at your logs, and the processes and transactions you use with Winshuttle, and let you see results in real-time like the time savings associated with eliminating manual data entry. That not only allows you to prove the savings you set up to accomplish – it also allows organizations to adopt a continuous improvement approach for business processes, giving you the opportunity to correctly prioritize and scope the improvements you want to cover.